What is Cartwheels & Coffee? 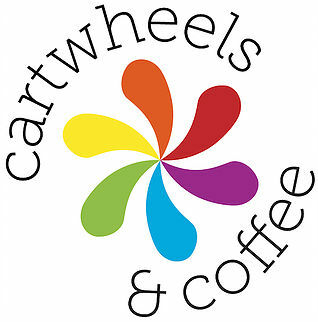 Cartwheels & Coffee is located in the heart of Carytown. It is owned by Area 10 Faith Community, a church that began meeting in September 2008 in the historic Byrd Theatre. The Byrd Theater is perfect for the church. However, Area 10 Faith needed a place for the kiddos to roam. And from there, the idea of Cartwheels and Coffee was born. They wanted to provide something useful to the community that wasn’t already there. The building that hosts Cartwheels & Coffee is just doors down from the Byrd theatre and a perfect space for the church office. 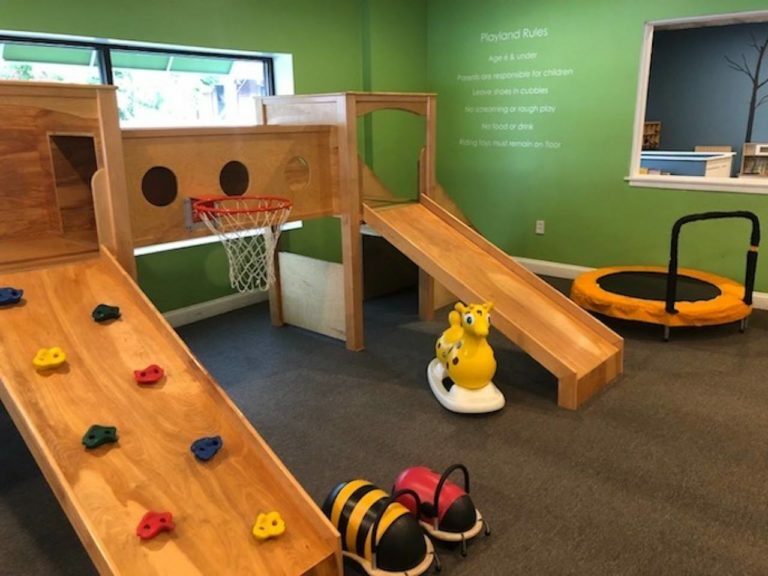 It is also great for early mornings and afternoon hours because the padded walls make it easier for you to relax while watching the toddlers play. Cartwheels and Coffee is open weekly Monday through Friday from 8AM ‐ 2PM (hours change seasonally). Saturdays are reserved for private parties, and of course, Sundays they are closed for church use. Children under 1 year are FREE. Toddlers over 1 year are $5 each with $4 per additional child. In the afternoon, there is a discounted rate of $3. Membership passes are available to ease of entrance and for a discount. Mommies and daddies seem to love this place. Every time we’ve been, its very busy. But that doesn’t take away from the ability to do some work while you are there. It’s a perfect spot to get work done while watching the little ones get tired out. There are tables and chairs and outlets for your computers. Grab a cup of coffee, tea, and a snack while you play or work. Private events, such as birthday parties, start at just $200. 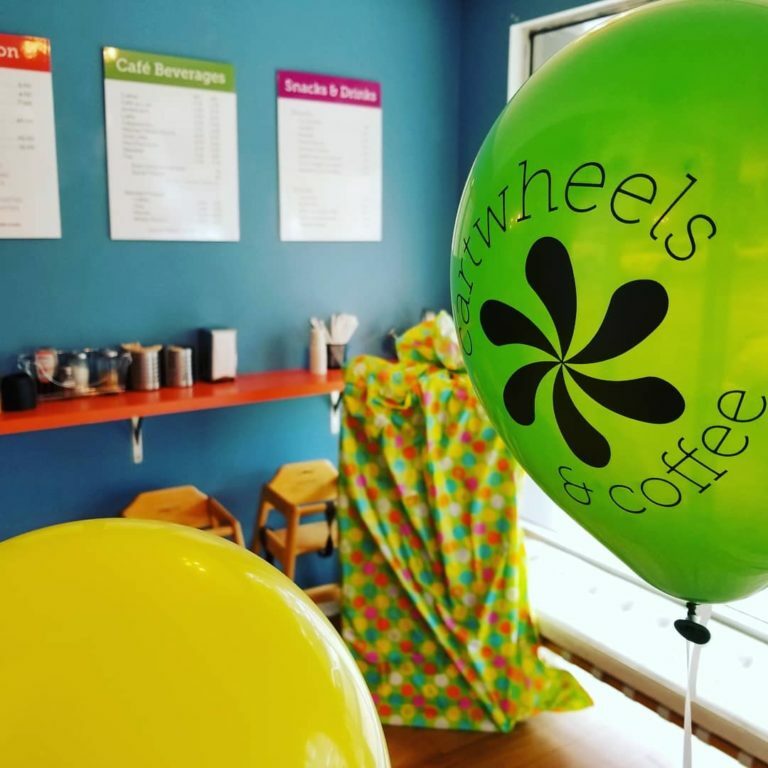 Cartwheels & Coffee seems to boast a large area for parties that would be safe for all ages! Their facebook page shows many party photos that look super fun! At Cartwheels & Coffee, there is more than just a chill zone for you and your kid. Each week, the cafe has special events just for the kids to play. 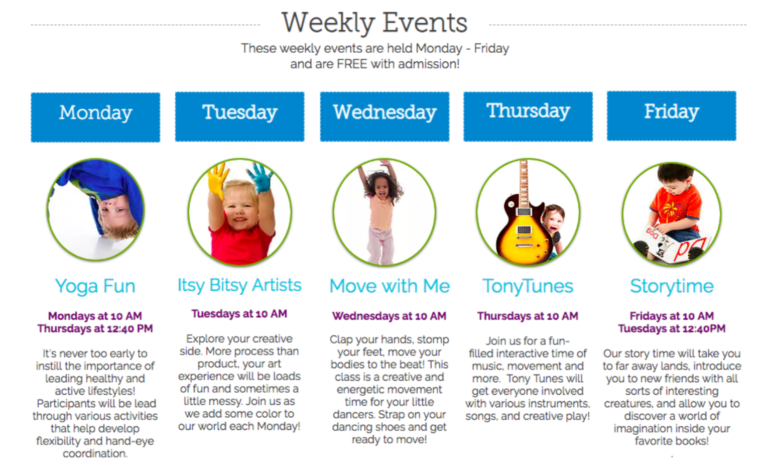 From Storytime to Itsy Bitsy Artists, your your toddler will have a blast. And who knows, maybe even get a tuckered out enough before going back home for a good nap! These events are held each week Monday through Friday and are FREE with admission! Check out their website for more info.